Low-cost Spay/Neuter Program – NEW! 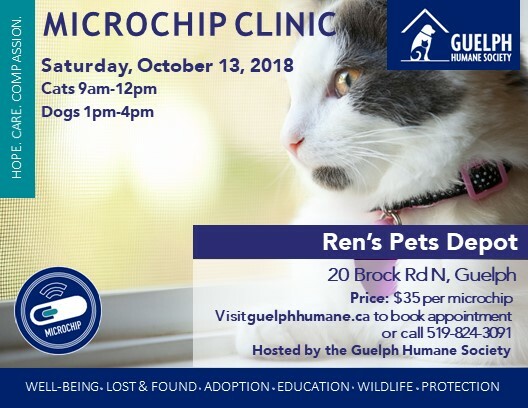 On Saturday October 13th 2018, the Guelph Humane Society will be hosting a Microchip Clinic! This clinic will take place at Ren’s Pets Depot, located at 20 Brock Road North, Guelph. We will be booking cat appointments from 9:00am-11:00am and dog appointments from 12:00pm-3:00pm. A microchip is a safe and effective form of permanent identification! GHS can understand that a missing pet is a stressful situation, especially if the pet does not have any form of identification or licensing. A microchip can allow lost pets to be reunited with their owners much quicker! It is a small chip about the size of a grain of rice that is implanted under the skin. When a lost pet is found, animal shelters and veterinary clinics can scan the pet (using radio frequency identification technology), and the scanner will display a number that is matched in a database to an owner’s contact information. 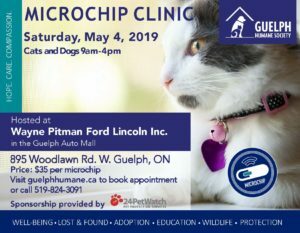 Click HERE to register and book your pets microchip appointment! The price is $35 per microchip. Please contact the Guelph Humane Society at 519-824-3091 for more information.